Here all the spring config classes are inside the package com.devglan.config and all the static components inside webapp/ui. The jsp pages are defined inside WEB-INF/jsp. The dependencies here are usual dependencies for a spring mvc application. spring-webmvc - provides core HTTP integration including filters. Including this dependency automatically includes spring-web. itext - It is required for pdf view. poi - It is required for excel view. maven-war-plugin - This is required to build war package by maven as we are excluding web.xml based configurations. Following is the controller class which is mapped for /users. It is a normal controller class that returns ModelAndView and based on the requested url the resolver will be identified and corresponding response will be generated. Following is the service class that generates user details and returns to the controller. Let us define the POJO now. This implementaion will be automatically detected by SpringServletContainerInitializer which itself is bootstrapped automatically by any Servlet 3.0 container such as tomcat. ContentNegotiationConfigurer creates a ContentNegotiationManagernand configures it with one or more ContentNegotiationStrategy instances. 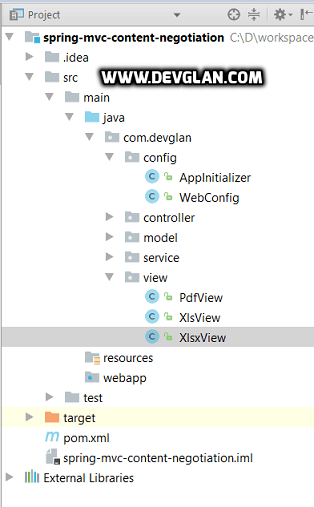 Now, let us define thee different view classes configured above. Following class will create the pdf view using the model objects which we sent through our controller class. Following is the Xls view. It will create the Xls view using the model objects which we sent through our controller class. Following is the Xlsx View class. It will create the Xlsx view using the model objects which we sent through our controller class. Following is the jsp page that will be rendered when no requests with any file extension. 1. Deploy the application to tomcat. 2. Hit the url as http://localhost:8080/spring-mvc-content-negotiation-example/users.pdf and you can see following result. 2. Similarly you can hit http://localhost:8080/spring-mvc-content-negotiation-example/users.xls for xls view and http://localhost:8080/spring-mvc-content-negotiation-example/users.xlsx for xlsx view.